Situated just ten kilometres from Melbourne city centre ( a 20 minute rail journey from the station across the road ), Chadstone Walk Apartment epitomises the upmarket five star accommodation travellers have come to expect. If shopping is your thing, world famous Chadstone the Fashion Capital is a ten minute walk away. Caulfield Racecourse and Monash University are just two train stops away whilst Oakleigh, with it's multicultural Greek heritage is two stops the other way. And getting to the Australian Open, Boxing Day Test Match, AFL and the Australian Grand Prix couldn't be easier. At the top of a short flight of stairs ,protected by a security gate with camera and intercom, is a spacious two bedroom idyll suitable for couples or families up to four people. In 2013 the apartment was completely renovated and refurbished with designer furniture including two leather couches, coffee table and a beautiful dining setting. The lounge features a 50inch Panasonic TV and Blu-ray DVD, including FOXTEL. Both bedrooms also have a wall-mounted 32inch TV, top class comfortable mattresses and crisp hotel quality linen. The main bedroom has a KING bed which can be converted to twin beds whilst the second bedroom has a QUEEN bed, suiting in total, two couples or one couple and two singles. In the kitchen, the gas cooktop, oven, dishwasher and full sized fridge/freezer are all BOSCH appliances, while the Euro Laundry is fully equipped with iron and board and Bosch washing machine and dryer. The bathroom sparkles with a walk-in shower and you are pampered with Egyptian cotton bath towels. The apartment has ducted heating and evaporative cooling throughout. Of course, your new home is smoke and pet free, thereby assuring you of a fresh "at home" feeling with lots of natural light when you open the door, while at your doorstep are many shops including a post office, bank, bakery, supermarket and various eateries. Everything you need, and more, is at your door ! Clean, comfortable and everything the pictures showed. The apartment is very nice and the location is great. The owners were fantastic to deal with and highly recommend this place. Nice clean property, great location. The apartment was great!! Awsome location near chadstone and easy access to train. Neat tidy setup, perfect for a business trip or small family on holidays. I was very impressed with the apartment and would definitely stay here again and recommend it to others. 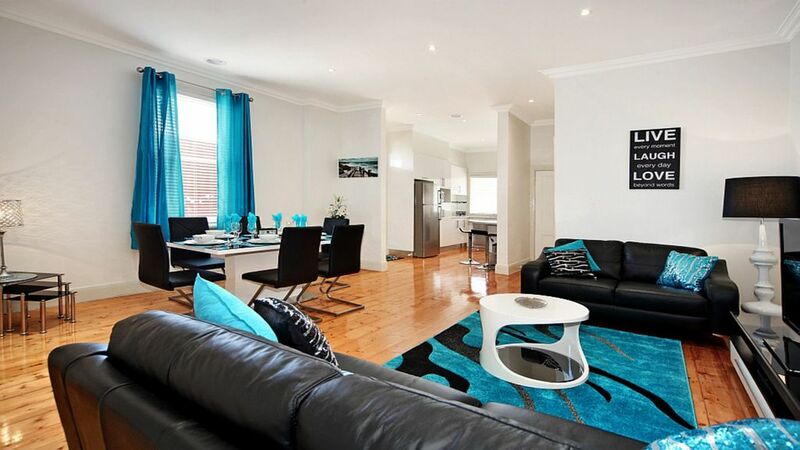 It was comfortable and clean, had great facilities and it is located right next to Murrumbeana Train Station. Thank you, Peter and Arleen!